The videos and photos of 2K Walk, organized by Bigg Boss Telugu 2 contestant Kaushal's fan clubs Kaushal Army, have taken internet by storm with #KaushalArmy2KWalk trending on social media. Bigg Boss Telugu 2 contestant Kaushal's fan club Kaushal Army put up a great show of their strength through 2K Walk in Hyderabad to prove that they are not paid group. 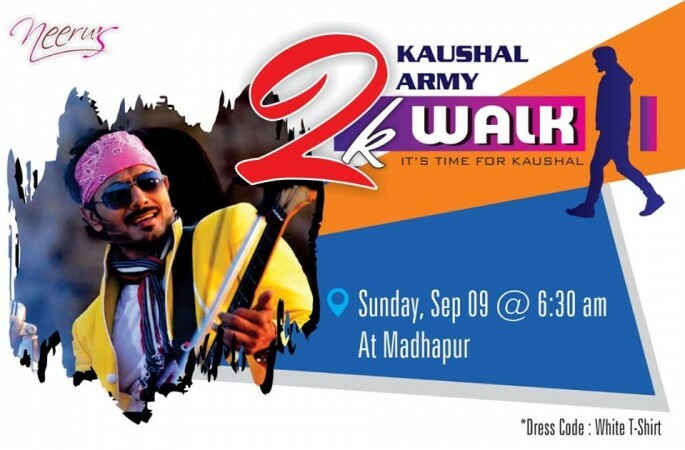 The videos and photos of this show have also gone viral and #KaushalArmy2KWalk is currently trending on the social media. Kaushal has amassed a huge number of fans across the world through his stint inside the Bigg Boss Telugu 2 house. His fans are often seen fighting and getting into heated arguments with the fans of other housemates. As the show nears its finale, it has turned violent and abusive, which made many think that Kaushal Army is a paid group and they are run by a PR company. A group of fans from Hyderabad decided to hold 2K Walk to show the world that they love Kaushal and they are not paid for it. They extend unconditional support to the actor. They requested other Kaushal fans from the city to assemble at Madhapur at 6.30 am on Sunday. Kranthi Chintu, the man behind this 2K Walk, tweeted, "2K Walk @ 6:30 am Tomorrow. Location: Kakatiya hills arch, Near maharaja chaat, madhapur road. Time : be there by 6:15 am Dress code : White t-shirt (Kaushal army stickers provided to you tomorrow). Refreshments will be provided. #bigbosstelugu2 #kaushalarmy #biggbosstelugu2"
Over 2,000 fans of Kaushal took part at the 2K Walk in the wee hours of Sunday. They had a silent march to show their support to the most popular contestant of Bigg Boss Telugu 2. Many took to social media to share their views on this road show and they also shared their videos and selfies, which stormed the social media and kept #KaushalArmy2kWalk trending on top. Here are some of their posts. Signing off from the #KaushalArmy2KWalk. Got to witness the offline version of the online hysteria I see everyday. No one would've imagined that a show like #BiggBossTelugu2 would lead to something like this. Was very happy to see some of you folks in person. Cheers!!! U r really blessed with lot of love..
No Replacement for #Kaushal in Bigg Boss history.... ??? Star Hero Level Craze... ??? More than 2K people participated ? ?